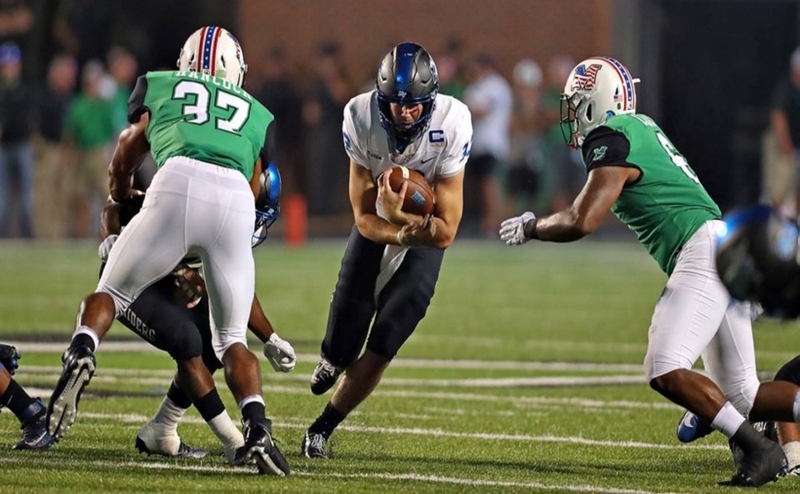 The Middle Tennessee State Blue Raiders (3-2, 2-0) traveled to Marshall to take on the Thundering Herd Friday night. 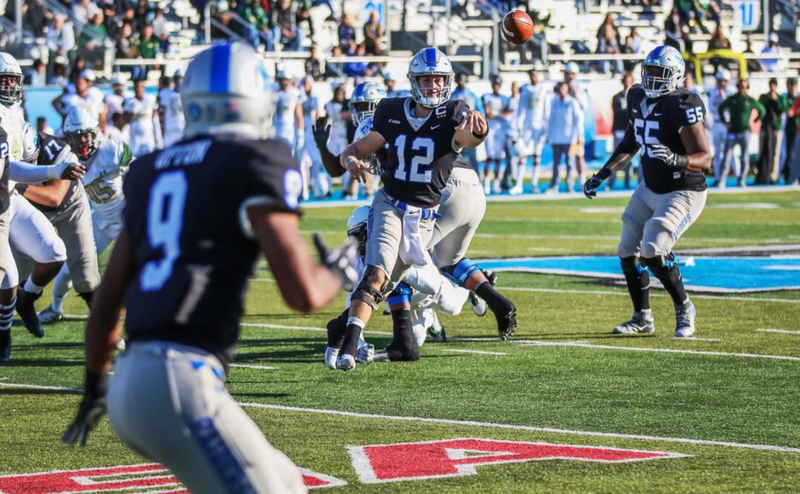 The Blue Raiders came in on a short week after defeating the Florida Atlantic Owls last Saturday. 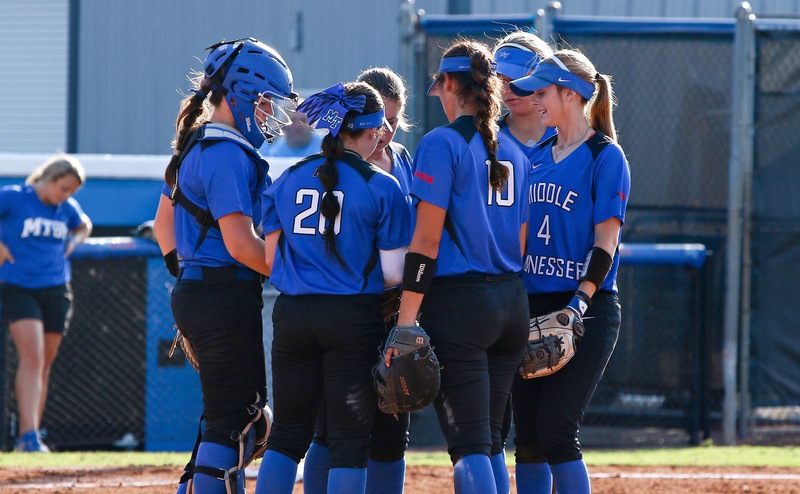 It was a tightly contested game until the Blue Raiders offense exploded in the second half to close out the game and give Middle Tennessee its second conference win of the season. The Blue Raiders had successful opening drives on offense and defense. Middle Tennessee received the opening kick and was able to connect on short screen passes to drive down the field. That setup the Blue Raiders in field-goal range and allowed the team to put points on the board to take a 3-0 lead. For the defense, it was the first time this season that the Blue Raiders did not give up a touchdown on their opening drive. Marshall’s defense was able to contain the Blue Raiders high-powered offense and hold them to just 10 points in the first half as the Thundering Herd took a 17-10 lead into halftime. Middle Tennessee’s lone touchdown in the first half came from a Brent Stockstill five-yard touchdown run. Not only did Stockstill score the only first-half touchdown, but he eclipsed 10,000 passing yards in his career, which is a Blue Raider school record and makes him only the third active FBS player to reach that milestone. The Blue Raiders made their adjustment during halftime and were able to take command to close out the game. 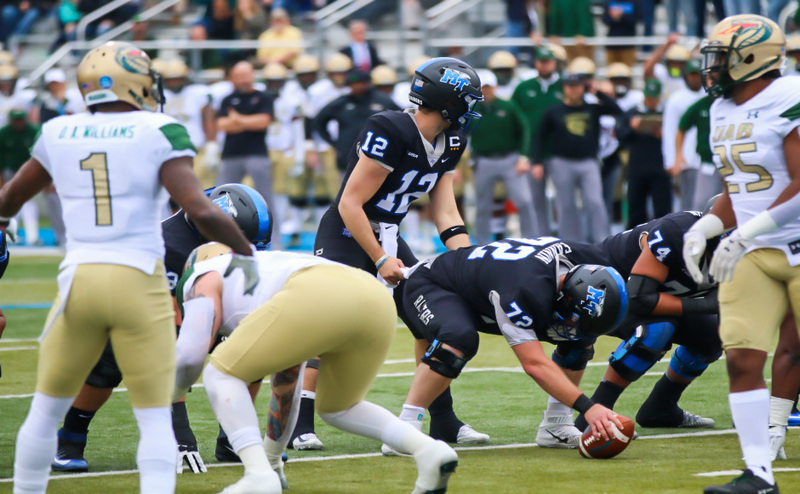 The Thundering Herd missed a field goal on their opening drive to begin the second half, which set up great field position for the Blue Raiders. Marshall was called on defensive pass-interference on the ensuing drive to set the Blue Raiders up within the 10-yard line. Brent Stockstill took advantage of the opportunity and delivered a five-yard touchdown strike to Patrick Smith to tie the game up. The Blue Raiders were able to capture the momentum and ride that momentum for the remainder of the game. Middle Tennessee was faced with a third-and-22 and were able to set up a fourth-and-one. The Blue Raiders decided to go for it, and it paid off, resulting in the second touchdown of the half for MTSU. The Blue Raiders held the first lead of the game since the opening drive when they led 3-0. The Blue Raiders weren’t content however and kept the pressure on the Thundering Herd. 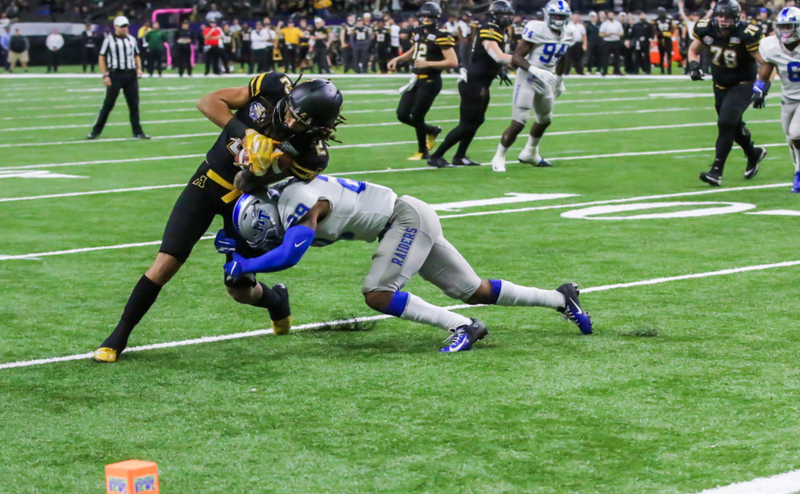 The Middle Tennessee defense held its ground again in the second half, which was similar to their performance last week against the Owls, and were able to give the ball back to the offense. The Blue Raiders were effective and efficient in their screen passes against the Herd. Stockstill was able to connect with Tavares Thomas on a screen pass for 18 yards and another MTSU touchdown. Thomas’ touchdown extended the Blue Raider lead to two possessions, and MTSU held a 31-17 after scoring 21 unanswered points. The Blue Raiders were able to ride Stockstill’s left arm and record-breaking night to secure their second consecutive conference victory. 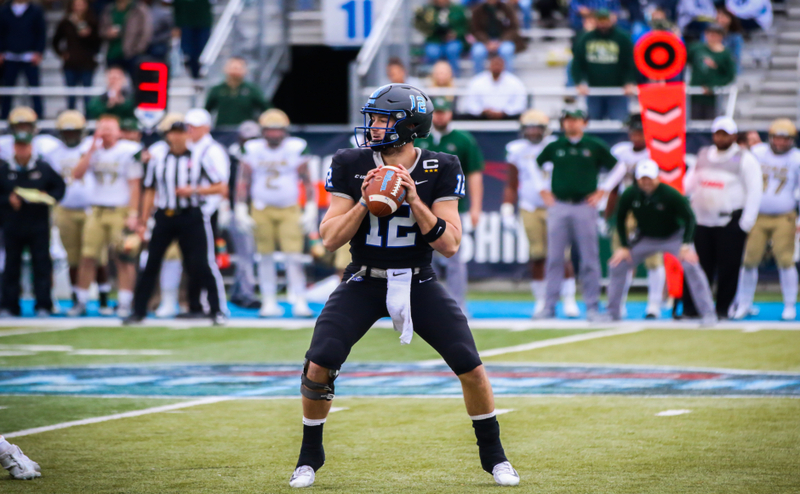 Middle Tennessee now sits firmly in the driver seat of the conference with Florida International next on the schedule. The Blue Raiders will travel to FIU to take on the Panthers next Saturday at 6:30 p.m. Middle Tennessee will look to keep their hot streak going and move to 3-0 in the conference.